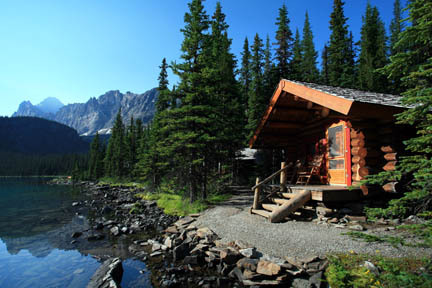 Spending a night at Lake O’Hara Lodge is a special experience, and one that draws familiar faces year after year. On a practical level, it allows hikers not equipped for overnight camping the opportunity to explore one of the finest hiking destinations in all of the Canadian Rockies at their leisure. The 15 one-bedroom cabins, each with a private bathroom, are spread around the lakeshore, while within the main lodge are eight rooms, most of which are twins and share bathrooms. Rates of $460 s, $595 d for a room in the main lodge (shared bathrooms) and $860 to 865 d for a cabin include all meals, taxes, gratuities, and transportation. As the lodge is located 13 kilometers (eight miles) from Highway 1, guests arrive by a shuttle bus that departs from a parking lot three kilometers (1.9 miles) west of the Continental Divide and 15 kilometers (nine miles) east of Field. Between late January and April, the eight rooms in the main lodge are available for cross-country skiers for $337.50 per person, inclusive of meals and ski tours.